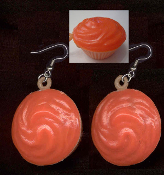 Funky Huge Vintage Orange Frosted CUPCAKE EARRINGS - Retro Junk Fun Food Yummy Dessert Novelty Charm Costume Jewelry - BIG realistic dimensional plastic toy gumball vending machine charms, approx. 1-5/8-inch (4.06cm) diameter x 1-inch (2.5cm) deep. Great birthday party and Halloween snack favors!